The iPod shuffle is quite possibly the smallest piece of hardware ever to carry an Apple logo. The music player is about the size of a pack of gum (and just in case you get temporarily confused, Apple reminds you on its Web site not to eat the iPod shuffle). The tiny shuffle weighs in at less than an ounce and feels like next to nothing in your hand or around your neck. Yet, befitting a product bearing the iPod name, it’s a very capable digital music player. At $99 (see Best Current Price ) for 512MB of storage and $149 (see Best Current Price ) for 1GB, the iPod shuffle holds a lot less than any other iPod, but it costs a lot less, too—as much as $150 less than the iPod mini (see Best Current Price )(and it offers more storage than comparably priced flash-based players from other companies). In short, it’s the iPod for people who never thought they’d buy an iPod. It’s also great if you want a second iPod. If you haven’t gotten your hands on one yet, here’s what you need to know. In keeping with the spirit of the iPod, the iPod shuffle includes a navigation ring—but not a scroll wheel. To play or pause a song, press the big button in the middle of the wheel. You use the same button to switch the iPod shuffle into Hold mode—just hold this button for three seconds. Adjust the volume with the plus (+) and minus (-) buttons at the top and bottom of the wheel, and move from one song to another by pressing the previous and next buttons at the sides. To fast-forward or rewind a song, press and hold one of these buttons. The iPod shuffle has another LED that flashes green to indicate that it’s received your command. This LED can also flash orange and will do so (sometimes with alternating green flashes) to signal conditions such as Do Not Disconnect or Error. Headphones plug into the top of the player, and removing the cap on the bottom reveals the iPod shuffle’s USB 2.0 connector (which also works with older USB 1.1 computers, but more slowly). Although USB 2.0 has a maximum bandwidth of 60 MBps, you’ll notice that the transfer speed of the iPod shuffle is much slower than that of other iPods. That’s because flash memory is much slower than the hard drives in other iPod models. Shuffling into iTunes Plug the iPod shuffle into a USB port, and it behaves very much like a standard iPod within iTunes (you must update to iTunes 4.7.1, which is included in the package or available via OS X’s Software Update). Like other iPods, the player appears in the Source list as a destination for songs in your iTunes library. 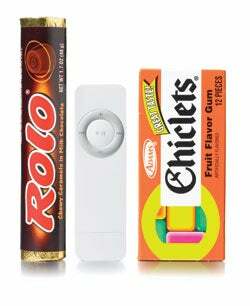 Once you select the iPod shuffle in the Source list, however, you begin to see how it differs from other iPods. You can, of course, drag songs manually to the tiny player, but when you select an iPod shuffle in the Source list, you’re greeted by a new Autofill pane at the bottom of the iTunes window. Within this pane, you can choose the source for your music—your entire iTunes music library or a particular playlist. You can select Choose Songs Randomly, Replace All Songs When Autofilling, or Choose Higher Rated Songs More Often. Although you could do the same kind of thing with the Smart Playlist feature on other iPods, this is a more convenient way to go about it. While this is a good start, it’s only a start. To get the most out of the iPod shuffle, turn to iPod preferences within iTunes. 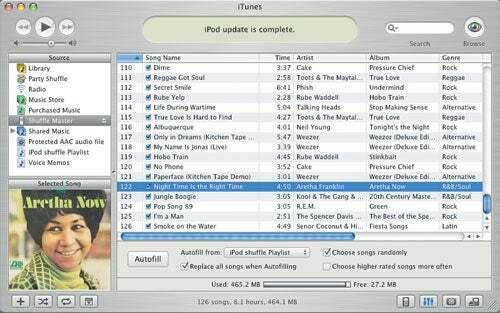 Here, along with the usual Enable Disk Use option (more on that in a minute), you’ll find a new option—Convert Higher Bit Rate Songs To 128 Kbps AAC For This iPod. This is a necessary and sure-to-be-appreciated feature. With a device that holds only 512MB or 1GB of songs, every megabyte counts. To protect yourself from filling your iPod shuffle with songs that weigh in at tens of megabytes, the iPod shuffle won’t accept songs encoded as AIFF or Apple Lossless files (although, for some reason, WAV files are supported). But the conversion option ensures that you’re not precluded from listening to songs encoded in those formats. Once you enable the option, iTunes will convert the tracks to 128 Kbps AAC files on-the-fly as it syncs with the device (while maintaining the original file in the iTunes library). This conversion does slow down the sync. On a 1.25GHz PowerBook G4, for example, it took about a minute for iTunes to convert a 7-minute AIFF file and move it to an iPod shuffle. Regrettably, this option is currently available only for the iPod shuffle. The other notable option in the iPod shuffle’s preferences is within the Enable Disk Use section of the window. If you turn on disk use, you use a slider to split the iPod shuffle’s storage between music and data (on the $99 model, the slider runs from 120 songs [0MB of data] to 0 songs [512MB of data]).